Volume is calculated as Length x Depth x Width. There are 1000 litres in a cubic metre. 1 cubic metre of product covers, 10 square metres at a depth of 100mm. A roll of turf covers 1 square metre. (0.5m wide x 2m long). 40 x 25 or 33 x 30 litre bags of product make 1 cubic metre. 1 m3 Compost Soil weighs approximately 1.2 tonne. 1 m3 of mulch weighs approximately 300kg. To mix 1m of concrete you need – 1.2 T blue metal, 0.6 sand, 15x 20kg bags cement. 1.25t of sand + 7 x 20 kg bags of cement lays 1000 bricks. A standard brick is 230 x 110 x 76mm, 39.5 bricks make up 1 square metre. Value for money is achieved by reducing the number of deliveries you need. Sometimes we are able to carry 2 different bulk products on our trucks, depending on the quantities. Sleepers can usually be also delivered on top of product, but the 3.0 lengths can sometimes be an issue with the 14.5 T Trucks. Truck access is a consideration. The information below is a guide to what we can deliver. Our trucks will not go off main access unless the access is firm and clear. After rain the trucks will stay on the main access roads. Our drivers will assess the access – no guarantees can be made by office staff until the driver has arrived on site and assessed the conditions. They will not scratch past trees even if you don’t mind a few branches broken. The drivers are responsible for our trucks and will not go anywhere unless access is clear of branches, power lines and the ground is firm. The trucks carry up to 14 Tonne and though you might be able to drive a car up, our trucks are much heavier and can sink. If the truck does get bogged on your site, it is the responsibly of the customer to arrange towing and pay the cost. WSC takes no responsibility past the kerb. If you require the trucks to go past kerb site, it is at the customers own risk and the customers insurance if damage is done. 4.5t Truck – Needs minimum clearance of 2.7m width and 3.0m height. 14.5t Truck – Needs minimum clearance of 3.0m width and 4.0m height. All trucks have one divider in them for split loads. Load quantities will vary depending on products. Semi Trailer with Forklift unload for Pavers, Retaining Wall Blocks, Concrete Sleepers and Bulka Bag deliveries. Also for large sleepers orders where we can’t tip off due to space limitations. Adding compost and wetting agents make the soil hold more water. Add one third compost to your garden bed and water in with a wetting agent. Water well and deep into the soil, rather than frequent shallow watering. HOW DO I KEEP PESTS AWAY FROM MY GARDEN? No one likes spraying for pests, and if your plants are strong and healthy they’ll survive a few pests. Adding a rich compost to the soil, fertilising occasionally, and mulching regularly is the key. The best defence is generally attracting both birds and other insects. Lots of flowers for nectar and shrubs for birds to hide in will make a huge difference. If you really have to spray, look for the natural products rather than man made chemicals. Try soapy water first because many bugs don’t like it. Mulch at a minimum of 75mm deep to stop weeds and retain moisture. As soil microbes break down, always fertilise your garden before mulching. Level areas with Turf Underlay (River Loam) before you turf. 100mm of compacted road base (scalps) should be laid below pavers if required to support vehicles. 50mm of compacted road base should be laid below pavers for foot traffic. 30mm of washed sand on top of scalps to bed pavers into. WE pick up empty pallets on completion of your job. Give us a call with your address and we will pick them up. Leave them in view from the road so the driver can see them. When laying pavers, due to the result of natural raw materials used in concrete masonry, some variation between pallets/products is to be expected. Variation in colour and texture of masonry products may vary from brochures, displays or samples due to raw material characteristics. Order all your pavers for your area at the same time. This will ensure that the pavers will come from the same batch. It is also advisable to work from all pallets you get, as you are laying them. This blends the colours in better. Don’t use up one pallet and then move onto the next pallet. If you are not using the pavers straight away, unwrap the plastic from the pallets to prevent them sweating. This will reduce the effervescence occurring when concrete sweats. For the safety of our customers, we don’t allow you to fill up buckets or bags that you bring in. Our products are available in 50L bags for Mulches, and 30L bags for Sand/Soil/Pebbles. We have a great relationship with some landscapers in the Canberra Queanbeyan areas, so come in and talk to us about your next project and we can recommend a landscaper best suited for the job you have in mind. Manually loading light vehicles can generate the risk of injury. WSC is committed to maintain your safety while on our site. To avoid injury, WSC expects you to minimise the risk by following this guideline. The guileline provides clothing requirements and procedures. Wait in your vehicle (or away from trucks, traffic and forklift) until forklift driver has dropped your goods and informed you it is clear to start loading. Load and secure using the Load Restraint guide. Keep in mind – Do not attempt to lift by bending forward. Bend your hips and knees to squat down to your load, keep it close to your body, and straighten your legs to lift. Cover and tie down your load. Tarps and ropes available from the office if you have forgotten to bring yours. 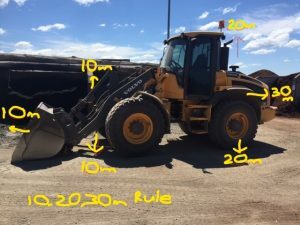 The 10, 20, 30 Rule establishes rules for Light Vehicles to manage the interaction between light vehicle and heavy earthmoving equipment. Keep these distances when driving around the yard. Make sure loader operator sees you and acknowledges you prior to moving around the yard. Does Synlawn synthetic grass get hot? Synlawn has a range of grasses that utilise “cool” yarn. The “Cool Plus” grasses are approximately 25-30% cooler than other products. Our most popular Synthetic Turf is the Classic 35mm great for full sun area as is has the exclusive HeatBlock technology. HeatBlock Technology lowers rising temperatures by reflecting sunlight, thus reducing heat build-up and emissivity. Heat build-up occurs in ost materails when thermal energy from the sun’s rays hit the surface of an object. In the same way dark clothing absorbs more heat than light clothing, artificial grass can also hold in heat making it uncomfortable when it’s hot outside. Therefore, SYNLawn with HeatBlock Technology incorporates infrared reflective pigments that help dissipate heat build-up and becomes up to 20% cooler than similar artificial grass products. Is SYNLawn child and pet friendly? Absolutely. SYNLawn is manufactured to Australian manufacturing standards and is 100% child and pet friendly. SYNLAwn has been installed in many child care centres and schools as well as commerical pet facilities such as the North Melbourne Lost Dogs home. Very little. Simply use a plastic rake (lightly) occasionally to stimulate the fibres. Remove any large debri such as sticks and weeds. A little maintenance occasionally will keep your lawn looking like new. Will the grass fade? What is the warranty and life expectancy of the grass? No. All SYNLawn grass lines are UV stabilised and manufactured to the highest standards. SYNLawn Classic 35 come with a 12 year Australian manufacture’s warranty. The life expectancy of SYNLawn synthetic lawns is 20 years. Where is SYNLawn synthetic grass made? All the synthetic grass lines are made in Melbourne. This enables Synlawn to have the unique ability to maintain a hands-on approach in the quality control of the products. Visit www.synlawn.com.au for more information on this great synthetic.